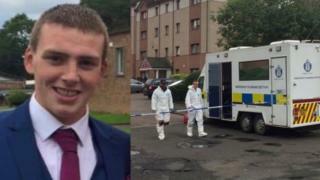 Police investigating a mass disturbance in the Castlemilk area of Glasgow in which a man was shot dead have made a fourth arrest. Jamie Lee, 22, died and another five people were injured near a play area in Ballantay Terrace on 8 July. Police said a 17-year-old man had been arrested and detained in connection with an alleged assault. On Thursday, a 45-year-old man was arrested for assault. Two teenagers have previously appeared in court. Police have also said they want to trace 23-year-old Jordan Owen - whom they described as "dangerous" - following the fatal shooting. Officers have warned the public not to approach him. He is described as 5ft 8in tall, with a slim build and short brown hair.